Flotilla sailing in Italy, Sardinia, base Portisco summer 2019 in the months June, July, August and September. We are delighted to announce a unique flotilla destination: flotilla sailing in Sardinia! Enjoy the beautiful surroundings, spectacular bays, wonderful sailing with good winds and the excellent Italian cuisine. 2 week special to Corse, 20 july! This 2 week special will visit the south coast of Corse for almost a week. So you will be 2 weeks away from the base! This flotilla will be fully booked by Christmas. If you like to join, hurry up before it is full! Flotilla sailing in Sardinia, there is no better way to discover the real Sardinia: the most beautiful beaches and bays of the Costa Smeralda are waiting for you to explore. The flotilla leaders let you enjoy a wonderful cruise along the Costa Smeralda to Southern Corsica. 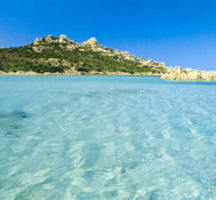 This is the perfect destination for your next sailing holiday, come sailing with us in Sardinia. Click here for a small video impression. GoFunSailing carefully selects the best luxury yachts, sailing yachts and catamarans for you in Sardinia. Our flotilla base in Sardinia is Portisco Marina, situated in the North and makes an excellent base for sailing this pristine area. The marina is very easy to reach from Olbia airport. A short taxi ride of only 20 minutes will take you to your boat. Click here for the measured wind speed and wind direction in Sardinia! Portisco Marina is located in the beautiful "Costa Smeralda", between Porto Cervo and Porto Rotondo only 10 minutes away from Olbia Airport. Portisco Marina is a natural Green Bay and is ideal for sailing tourism and offers a variety of services in a warm and welcoming environment. In the untouched places it is still possible to watch "la mattanza", the old fashioned way of tuna fishing. We have many sailingyachts in Sardinia. The length of the yachts is between 30 and 50 feet with 2-5 cabins, of different designs and models. We are sure to find what you're looking for. Be aware of the Italians, they all go on holidays in August. If you want to sail in August then book as early as possible. If you book before the end of 2018, you will get the highest discount. Go to the price list of the yachts that you can book with us for bareboat or Flotilla Sailing from Portisco Marina. Our flotilla is suitable for anyone that likes sailing and can navigate and has a sailing license. The flotilla leaders know the area and take you to the most beautiful places. You just have to enjoy!! Just click here and go to the other route from Portisco Marina. A pleasant day's sailing through Capo Figari, the Gulf of Olbia and between Tavolara and Molara. You can put at anchor in the bay of Spalmatore (excellent backdrops for anchoring), right in front of a beautiful beach, you can swim and enjoy a fantastic view. In the evening you can eat in the restaurant "Re di Tavolara." 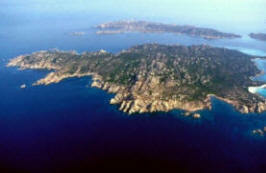 The Island of Caprera is part of the Maddalena Archipelago, and is with connected to La Maddalena Island with a bridge. It is a Natural Reserve. You can climb till the top of Monte Teialone and Poggio Stefano and look at the Archipelago. All around rosa granite rocks paint a wonderful landscape. Cala Coticcio is on the eastern side of the island. Small and narrow like a fjord. Southeast is Cala Brigantina, a narrow bay protected by the rocks. South you must see Punta Rossa, the beaches of Cala Portese, Porto Palma and l’isoletta del Porco. 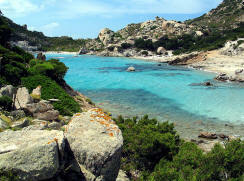 To be seen is also Cala Garibaldi, where the famous hero landed to reach his house. On the north are wonderful and from the land inaccessible beaches like Cala Napoletana, Cala Serena and Cala Caprese. To be seen on the island is the House of Garibaldi, today a museum. Gods couldn't make a better present to Corsica than Bonifacio! A white vessel ready to leave the country and sail to the sea. The charm of its narrow streets leading to the Citadel. Fascinating is the entry to the harbour, from far it seems like a split in the white limestone cliffs, inside the fjord, there is a meander, where boats stop if the harbour is full. After it Bonifacio! Remember you will be in France and you can find the “baguettes” and the “crêpes”. North Sardinia Sail tip: go up to the Citadel, especially in the windy days. 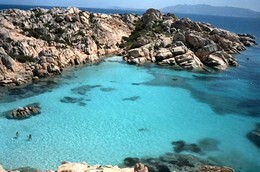 Budelli is part of the Maddalena Archipelago, is famous for the legendary “Spiaggia Rosa” (“Pink Beach”). The coral sand colour, the colour intensity of the sea and shape of granite rocks that surround the set it are an unique spectacle in the world, a natural monument to be observed in religious silence. Southwest from the island of La Maddalena, there are many small bays with transparent water, among them Cala Corsara is one of the most beautiful, from there you can sail along the eastern coast, finding many small bays (Cala Soraja, Cala Granara, Cala Conneri, Cala Canniccio, Cala Petranera) till Cala Grano, where you can moor and land. Through a small street you can shortly reach the fortifications of Punta Zanotto. One mile northern the Washington Reef, a unforgettable place for diving. La Maddalena, the main town in the islands is a small town, crossed by carrugi, the Genovese name of its narrow alleys, which climb to the hillside above Cala Gavetta, the port town around which has developed throughout the town. In town you can find all kinds of shops, restaurants and pizzerias. If you want to spend a night here you should make reservations, especially in the period of July and August. The island is full of many beaches: Spalmatore, where you can stay at the buoy: Cala Francese, a set sheltered from the wind, just behind Cala Gavetta. Another marina is Porto Massimo, in the northern part of the island. It’s a beautiful bay, just behind the marina of Porto Cervo. It is covered from Mistral, so when it is blowing, the marina can be full. The landscape is a fable, two beautiful sandy beaches, on the hill the famous Costa Smeralda’s villas with their green gardens. With an hour sailing you can reach Portisco and the Gulf of Cugnana. Porto Cervo today is the symbol of the Costa Smeralda, of luxury tourism and VIPs, of trendy cafés, restaurants and yachts, but also as a privileged place of where you can watch the international jetsetters. The coastline of Sardinia is an extraordinary sailing destination with hundreds of secluded bays, idyllic beaches and dramatic rock formations. Sardinia boasts an attraction for many by the diversity of its coastline; from the dunes of the Costa Verde to the green bays and spectacular cliffs of Cala Gonone. Striking at the fantastic Costa Smeralda are the magical beaches and a system of villages built according to a detailed urban plan. The area is a luxury tourist destination where very wealthy European and Arab VIPs visit in the summer. Weather and wind conditions in the North of Sardinia are the most constant. That means that most sailors come to the Costa Smeralda. The Costa Smeralda is also an excellent base for exploring the famous Maddalena Islands on the way to the French island of Corsica. There are two winds that are responsible for the stunning sailing conditions; the Sahara wind and the Maestrale. The Maestrale blows mostly along the West Coast, and for a few days can bring very powerful W to NW winds. While along the East Coast a S to SE wind dominates. In March the spring begins turning in May to early summer and in June you can enjoy summer daytime temperatures and cool nights. July and August are the most warm months. Also in the months September and October you can still enjoy the end of summer temperatures. The climate is subtropical and maritime. Sardinia has long, dry summers and mild, wet winters with possibility of snow in the higher areas. The average temperatures are between 14°C and 20°C, making the temperatures in summer, especially in the coastal areas around 30°C. In the upper parts of the island, the summer temperatures even reach the 40°C, in winter the average temperature is around 8°C. In the mountainous areas, the temperatures can fall below zero and in the spring and fall the temperatures are between 13°C and 16°C. The Maddalena Islands with its crystal clear waters, pink sand, a series of bays and rocks, blue cliffs that pop up from the deep sea floor, and many intense colors. The Maddalena Islands are a must for anyone who likes the beauty of this sailing area and wants to explore in Northern Sardinia. Flotilla in Spain, from Mallorca NEW in 2016! Contact us and we will send you a free quote on flotilla sailing in Italy. You can call us, 0031 6 20553904. We tell you how you can book a flotilla holiday. We sailed already for 6 years as flotilla leaders in Turkey and we did that with quite a lot of fun! In 2011 we moved to Sardinia where we personally lead the flotilla from Portisco Marina till 2015. In 2016 we started in Mallorca with our new flotilla. We look forward to see you in Mallorca!